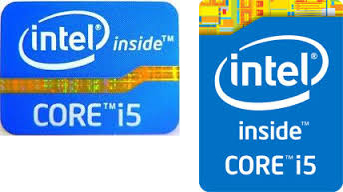 When is the Intel Core I5 not the I5? The gold top sticker indicates the Core I5 is the 4th generation core. This processor has better battery life compared with the 3rd generation; The 4th gen also has some performance upgrades – including integrated HD Graphics, Anti-Theft Security Technology and Turbo-Boost speed enhancements. In addition to a new Intel Badge, you can also determine which processor is being used by some terminology in the product descriptions which say either “4th Gen” or “Fourth Generation”. Or the processor may be called by its Intel code name, “Haswell”. Alternatively, the product spec sheets will often list the processor part number, which should start with the generation number. For example, the Intel Core I5-4300M. Intel has upgraded the I3 and I7 cores in addition to the I5, so look for the latest processor family on newer laptops, desktops and notebooks. Intel also introduced a new top end processor, ” Core I7 Processor Extreme “, and a new core called ” vPro “. When buying 3rd generation based systems, expect to see a nice price discount for products using the earlier generation devices. For more details on all the new Intel Core features, see the Intel Processor Family page. Where Can I Buy A Spacesuit?